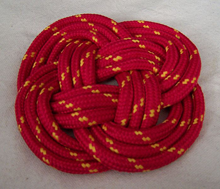 A Carrick Mat, a fine example of a decorative mat made from a single cord. The ends are tucked neatly out of sight. The mat can be pulled apart by the ends of the cord, but when they are joined, pulling any part of the mat might distort it somewhat, but the mat will maintain its integrity. So it is with blame when blame is part of the fabric of organizational culture. Suppressing blame-based behavior is not an effective means of driving it from the culture. Instead, we must find ways to motivate all members of the culture to alter their own behavior. Compelling abstinence from blame-based behavior patterns does not work. Photo (cc) Brian Ronald, courtesy Wikipedia. When organizations undertake to change their cultures, the cultures sometimes behave as if they were unwilling to change. They can behave almost as if they had minds and wills of their own. Because this phenomenon is especially noticeable when we're transforming a blaming culture, it's useful to understand how blaming cultures "fight back." An organizational culture is a blaming culture if blame plays a significant role in regulating behavior to ensure compliance with organizational expectations. Blaming cultures have difficulty reaching high levels of performance, in part because their people generally fear taking even reasonable risks. For example, a fear of being blamed for insubordination can cause an employee to refrain from questioning a superior's decision, even when that decision ought to be questioned. For more examples of the traits of blaming cultures, see "Top Ten Signs of a Blaming Culture," Point Lookout for February 16, 2005. When we try to reduce the incidence of blaming in a culture, we encounter special challenges. Here are three examples of what makes changing a blaming culture so difficult. Those advocating for removing blame as a management tool are likely to encounter supervisors who are accustomed to "killing the messenger." Change agents might sense progress when people deliver bad news without being subject to retribution, but the reality can be rather different. Supervisors might not immediately "kill the messenger," but they might eventually get around to it. For example, they can delay the execution for months or years to make it seem unrelated to the message delivery incident. The actual execution can take on any form, such as termination during a layoff or reorganization. In some cases, retribution can be delivered not by the offending supervisor, but by a proxy. is especially challengingculture that's attempting a transition, questioning incidents, procedures, or policies that are illustrative of the former blaming approach to behavior management can be interpreted as blaming and criticism. People who raise these issues are sometimes criticized for manifesting the old behaviors. The old ways remain in place because we regard questioning them as examples of the old ways. It's axiomatic that we cannot change what we cannot talk about. Unless we can openly discuss the costs and constraints of the status quo, coming to consensus as a group about ways to transform the status quo can remain out of reach. All change entails loss. All culture change degrades organizational performance temporarily, as people try new ways of working together. But in blaming cultures, the habit of blaming leads to blaming the change itself for the temporary productivity loss. Instead of accepting the loss as a cost of change, the change is criticized for the loss. That can lead to rejection of the change on the basis of degraded performance. Would you like to see your comments posted here? rbrentbaGxoYvUFAiMOnyner@ChacsXcMfnEscaiPFETFoCanyon.comSend me your comments by email, or by Web form. I offer email and telephone coaching at both corporate and individual rates. Contact Rick for details at rbrenYNAsVboGLtuzbvAsner@ChacCYbyGNwPUnrNYqiYoCanyon.com or (650) 787-6475, or toll-free in the continental US at (866) 378-5470.